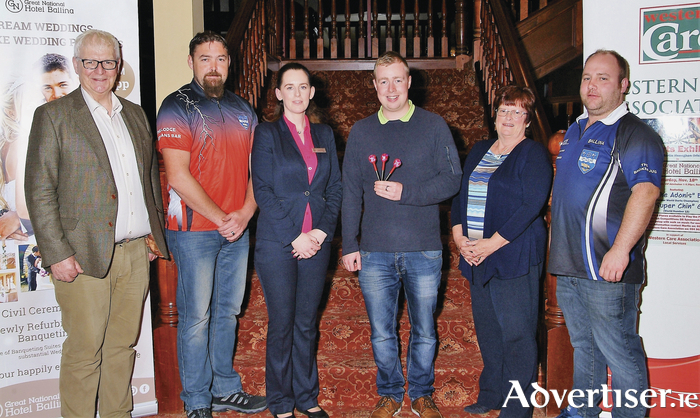 Photographed at the launch of the pro darts exhibition with Steve Beaton and Daryl Gurney in Hotel Ballina are: Joe Brett (fundraising manager, Western Care Association), Dave Farrell (Ballina District Darts League), Siobhan Scally (deputy general manager, The Great National Hotel, Ballina), Martin Heneghan (Irish captain), Ann Henry (Western Care Association), and David Doherty (Ballina District Darts League). Photo: John Moylette Photography. A pro darts exhibition featuring Steve Beaton (former World Darts champion ) and Daryl Gurney (World Number 12 ) organised by Ireland Darts team captain Martin Heneghan in support of Western Care Association local services will take place in The Great National Hotel, Ballina, on Saturday, November 18. Places in the exhibition are limited to 40 people, who will play against a pro in a full stage setup with walk on music for each player. Entry to play against the pros is via pub competitions or sponsorship cards. There is a VIP admission package available on the night for €30. This includes meet and greet the pros from 7pm, access to the pros' private practice room and bar, practice and photos with the pros, finger food and seating at VIP tables during exhibition. The offer is limited to a maximum of 30 tickets on a first come, first served, basis, the VIP admission package can be booked online at €33 including commission and postage at www.iregister.ie/v2/events/pro-darts-exhibition/ or tickets are available from the contacts below.